Houses of worship can rely on Analog Way's user-friendly and cost-effective products to create a far richer worship experience. Analog Way's products offer high-end real-time image processing and can support a large choice of sources and a variety of display opportunities such as widescreen and multi-screen projections, LED walls or 4K. All content can be easily handled and animated through Picture-In-Picture (PIP), titling, dynamic transition effects, etc. All systems may be operated by both technicians and volunteers with unrivaled user-friendly control interfaces. Designed to meet the needs of any type of house of worship, Analog Way's switchers can help capture the worshiper’s attention and convey the message to the audience in the most effective way. No matter the budget or requirements, Analog Way has the solution for both small congregations and mega churches wanting to enhance their worship experience. 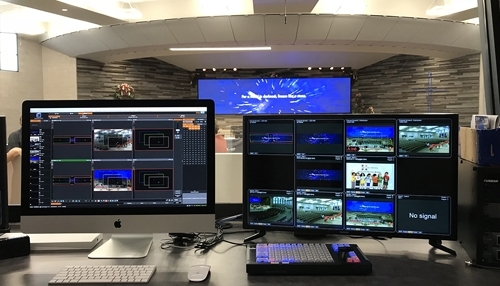 Canyon Del Oro Baptist Church near Tucson, Arizona has expanded its campus with a new sanctuary complex and video equipment upgrade. 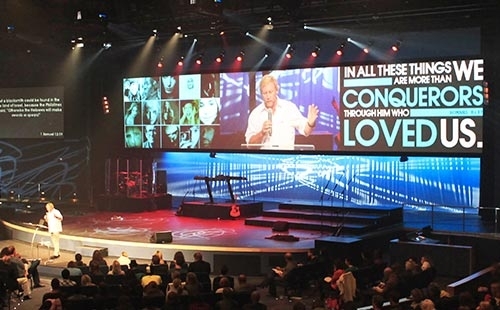 The church added an Analog Way Ascender 32 multi-screen processor to drive an Aurora 3.9mm LED videowall. Calvary Church in Grand Rapids, Michigan selected an Analog Way Ascender 16 multi-screen seamless switcher to drive its new LED wall.